We'd found the church at Tolleshunt Major locked without a keyholder. 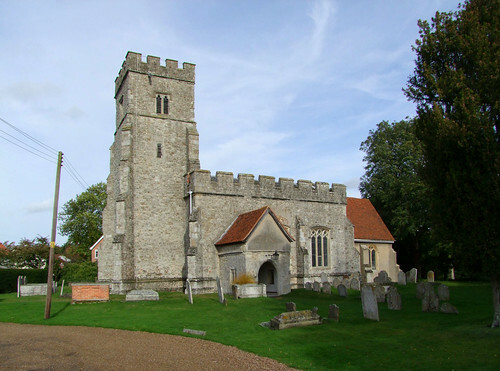 In visits to more than 120 Essex churches, it was only the fourth time I'd come across a parish church which was locked without a keyholder notice. The revised BoE had little to say about the interior, and it didn't seem worth pursuing the key on what would be a short late autumn day, although I did note that the Rector was that of the next church we planned to visit, Tolleshunt D'Arcy. We headed on to that much larger village, and found the church there, which shares the dedication of the last one, hard against the village high street. Locked. Odder and odder, this is in the heart of its village and according to James Bettley in the revised BoE has a good range of 20th Century glass. I went and knocked on the Rectory door, but there was no one in. If I tell you that I knew the next two churches were also his, you may imagine that my heart sunk (but to reduce your tension at this point, I'll tell you they were both open). The church is entirely built out of grey ragstone, a forbidding material and most un-East Anglian. I photographed a plaque in the porch to Neville and June Bamber, former churchwardens, died 1985. It didn't mention the fact, but they were two of the victims of the White Farm Murders, when five members of the same family were shot dead on the outskirts of the village in August 1985. Their son Jeremy Bamber is currently serving a life sentence for the murders, although the evidence increasingly suggests that he didn't do it. This gave me something to think about as we left Tolleshunt D'Arcy past White Farm on the way to one of Essex's more obscure outposts, Tollesbury.